The running back position is arguably the most volatile position in the NFL, and this is mainly due to constant injury and copious committee situations. Committees are where multiple running backs are constantly being substituted on and off the field because there isn’t anyone who is talented or versatile enough to be the sole workhorse. Because of this volatility, many bench backs have the opportunity to showcase their abilities and possibly become a full-fledged starter. This is why during your fantasy football drafts you must stash some backup running backs because they can pay mass dividends. For example, backups at the beginning of last season such as Jordan Howard and Bilal Powell ended up being major contributors during fantasy playoffs. The reason these two backs got more playing time is due to injuries suffered by Jeremy Langford and Matt Forte. Looking towards this year, I’ve compiled a list of backup running backs who are one injury away from being a superstar. Kareem Hunt got drafted 86th overall this 2017 NFL Draft (Chris Nicoll/USA TODAY Sports). Hunt was a highly prolific running back at Toledo, where in every season besides his freshman year he garnered at least 1,000 yards and 10 touchdowns. The main catalyst for this success was his speed, agility, instincts, and moves that allowed him to constantly elude defenders. This will most likely serve Hunt well in Andy Reid’s run heavy attack, where the last person with his type of skill set, Jamaal Charles, became a fantasy superstar. One main issue with Hunt is his lack of burst, but this is fine due to the fact that he is great in short yardage situations. Hunt is currently listed behind Spencer Ware at the running back position, but is one injury away from starting. This could very well happen because of Ware’s injury history, leading Hunt to become a very solid RB2, or even an RB1 if he can hone his skill set. 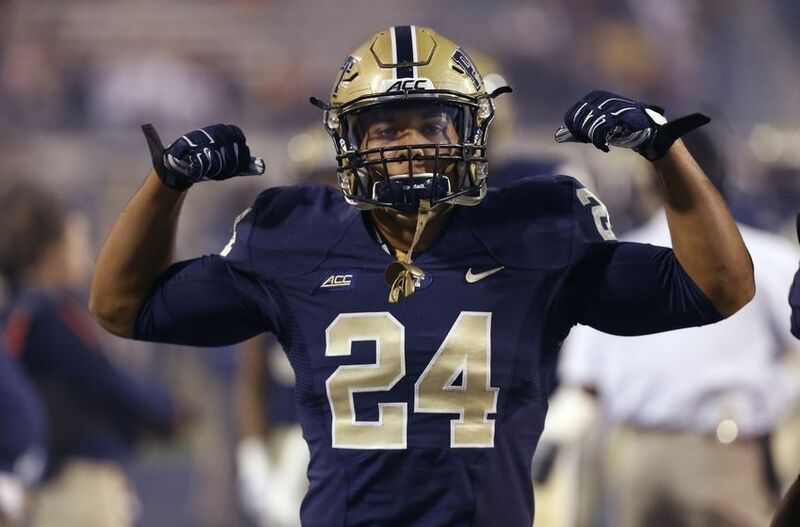 Conner was a goal line machine at Pitt, garnering 42 rushing touchdowns during his sophomore and senior years (Geoff Burke/USA TODAY Sports). James Conner is an inspiration that you should root for regardless of whether he is on your fantasy team or not. During his junior year at Pitt, he was diagnosed with Hodgkin’s lymphoma. Conner recovered and returned his senior year to rush for 1,092 yards and 16 touchdowns. He became a first-team all-conference player while winning the Disney Spirit Award and the ACC Brian Piccolo Award for his courage and determination. What is special about Conner is his ability to hit paydirt. This was showcased primarily in his sophomore year in college where he ran for a whopping 26 touchdowns. The reason he is a touchdown monster is due to his size and strength, exemplified by his 6’1″, 233 pound frame. His strength was shown during the combine, where he ranked ninth among running backs in the bench press with 20 repetitions. He is currently behind NFL superstar Le’Veon Bell on the depth chart, who despite being a legendary talent is an injury-prone player. Over his three year career, he has suffered two major knee injuries, a concussion, and a foot tear. Once Bell gets injured, Conner is a highly valuable RB2, and could possibly end up being the next LaGarrette Blount. Williams only had 27 rushing attempts his rookie season, stuck behind Mike Gillislee and LeSean McCoy (Geoff Burke/USA TODAY Sports). 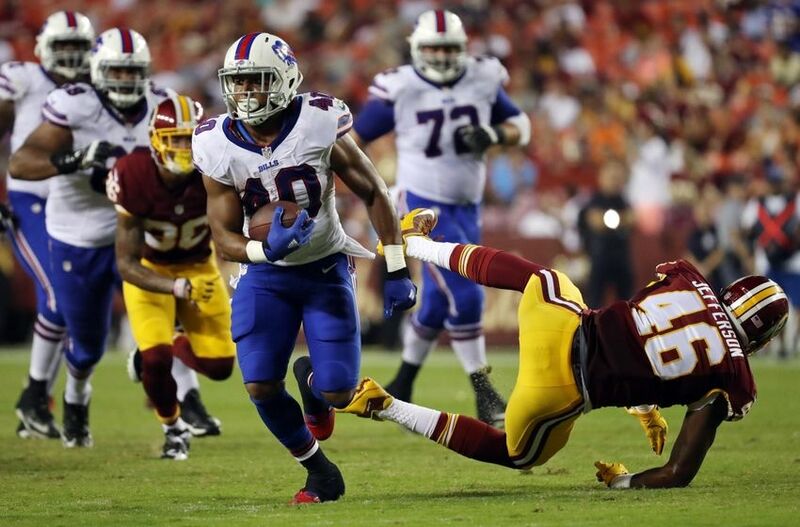 There isn’t much to say about Jonathan Williams except he’s average. Average size, average athleticism, and an average college career. Average isn’t bad, but it just means that Williams can never be more than an RB2 when LeSean “Shady” McCoy gets injured. This is because despite not being a great player, Williams is in one of the best situations of any back up running back in the NFL. This is first because McCoy has suffered at least one injury in every season since 2010, and is turning 29 this summer. While age and history aren’t on McCoy’s side, he is still on a franchise in the Bills that ran the ball more than any team in the NFL besides the Dallas Cowboys last season with 492 attempts. This high workload could also lead to a McCoy injury, so Williams would spell him every now and then. If McCoy gets injured, which is highly likely, Williams will then get fed repeatedly and have RB2-type numbers. D’Onta ran for 2,208 yards his final year with the Longhorns (USA TODAY Sports Images). We come from an average athlete like Jonathan Williams to a stud in D’Onta Foreman. At the University of Texas, Foreman ran for 2,028 yards and 15 touchdowns his senior year. This catapulted him into the elites of college football and showed everyone his outstanding athleticism. He has the size, strength, and agility to be good in short yardage situations. There are a couple issues with Foreman that include problems with instincts and ball security, but those can be fixed. The Texans have an easy schedule, solid offensive line, and favorable run-heavy scheme that could lead to Foreman being a good contributor to your fantasy lineup. This will happen only if Lamar Miller were to suffer an injury, and this could very well occur, as according to Sports Injury Predictor his chances of getting hurt next season are at 81%. Henry ran for 490 yards and 5 touchdowns his rookie season (Wikimedia Commons). I saved the best and most tantalizing for last. I say this because Derrick Henry is a monster athlete that has already shown his worth in college, where he ran for 2,219 yards and 11 touchdowns his senior year. Henry is strong, fast, agile, elusive, and has good instincts. Henry is a gym rat and rarely gets fatigued during games, which is ideal for being an every-down back. What’s even better is that the Titans are probably the most run-friendly team in the National Football League. They first of all have a top five offensive line, the second-easiest schedule in the NFL, and a run-heavy scheme that allowed DeMarco Murray to become an elite fantasy running back last year. Like many other backs in this section, Murray has an 88% percent chance of getting injured this season according to Sports Injury Predictor, and is at the non-ideal age of 29. If he does get hurt, Henry is in for a monster year that I’m certain will involve him putting up RB1 production. I appreciate that very much! Hopefully I can keep helping you succeed in fantasy sports.